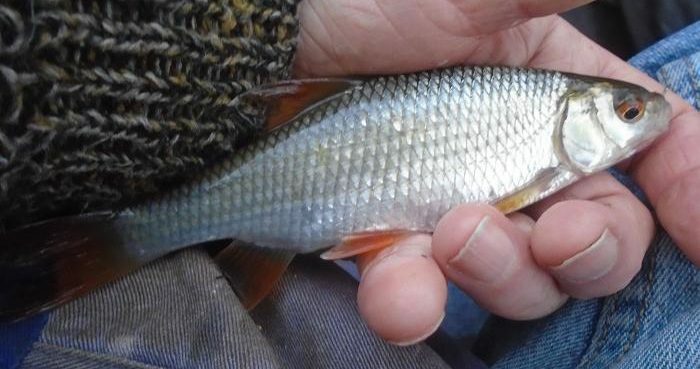 Two successful spawning years at my local Jeanes’ Pond in Braybrooke Park, had resulted in a dearth of small roach, rudd and perch crowding out the upper levels, eagerly attacking anglers’ baits meant for bigger fish. 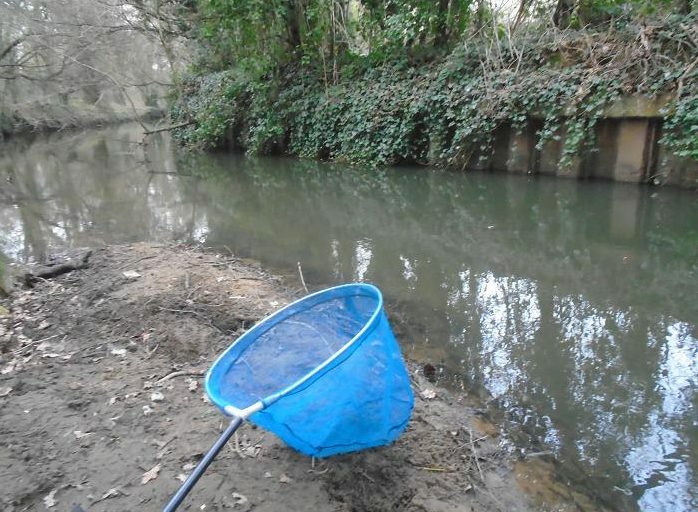 With the controlling club in close contact with the Environment Agency, it was suggested that the answer was another netting operation. 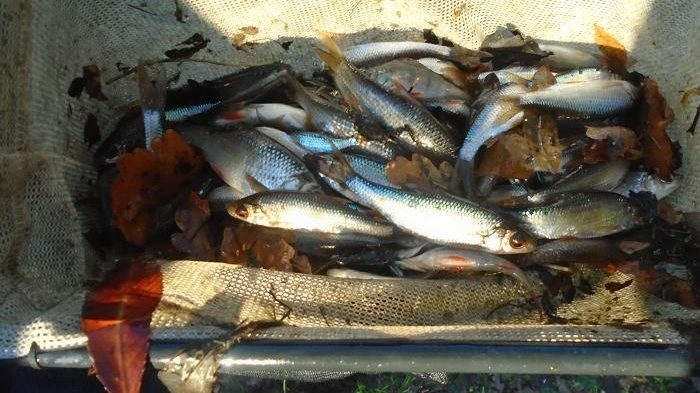 The first, three years ago had seen the removal of thousands of small fish from the pond, resulting in members catches including many more quality roach and rudd. 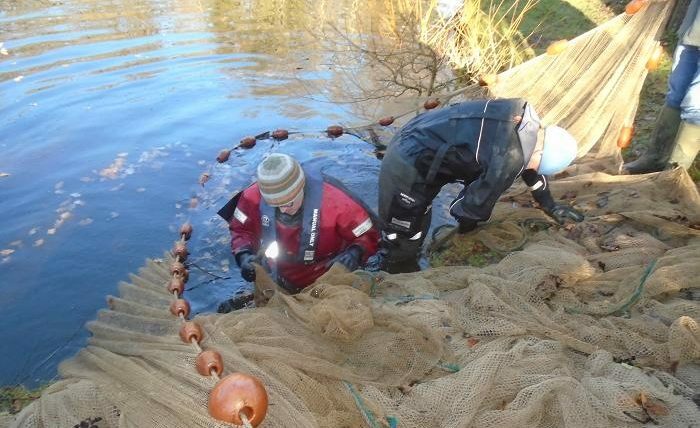 With temperatures in single figures, I arrived mid morning to find the netting well under way, with two Agency operatives up to their chests in freezing water. The net had been walked round the pond, until it met the fixed end, then slowly drawn in to a tight circle, the bottom of the net drawn up to trap the fish. Hand nets were continually dipped into the boiling mass of fish and passed up in a fireman’s chain to a water tank on the back of the Agency Landrover, all fish over 3 oz being returned, under the watchful eyes of club members. Several larger fish were evident in the bulging net, this pike the first to taste freedom again. Proof that the roach, rudd and perch were not the only successful spawners, was this young pike. 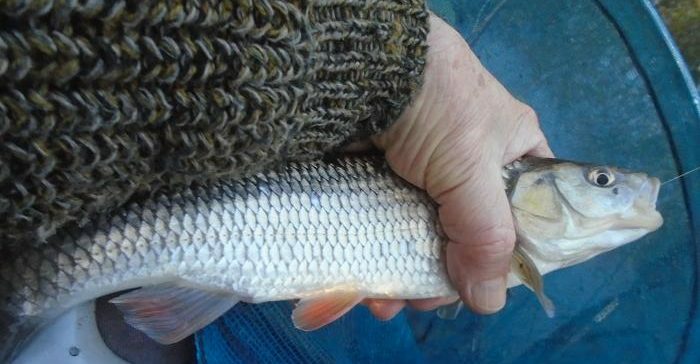 Often seen, but rarely caught, this white Koi must have had a rude awakening from its winter sleep. Another exotic, a gold Koi, emerged from the depths of the net, this fish had not been seen all season and was assumed taken by poachers, that had been leaving out unattended night lines attached to bank side bushes. Yet another pike from a water that was said to have no pike when I joined the club. A 10 lb pike was landed this season, on two different occasions, having taken anglers’ fish. 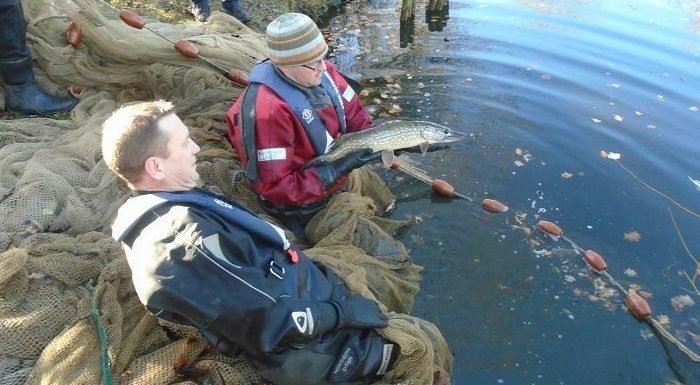 If the pike and perch do their job, netting sessions may not be needed in the future. 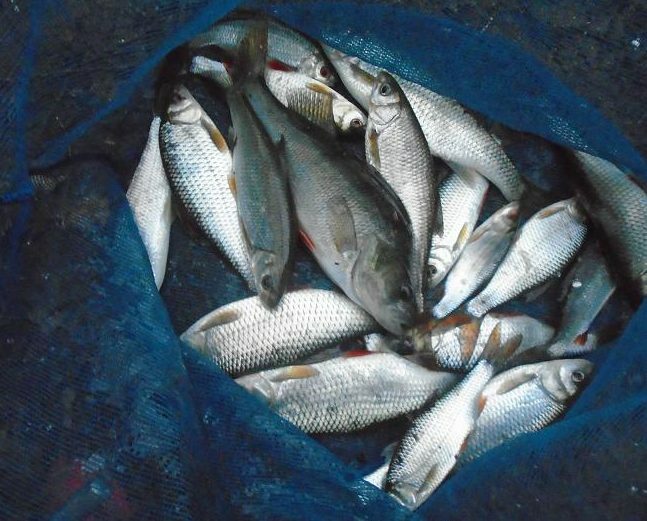 Just one sample of the fish taken with one dip of a hand net, perch, roach and rudd clearly visible. 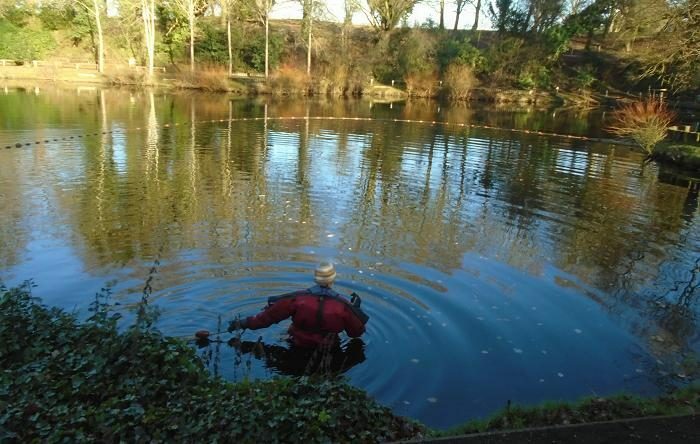 A rough estimate of 7,000 small fish were placed into oxygenated water tank, ready to be transferred to a small lake near Aldershot 15 miles away, that has been heavily predated by cormorants. Once the EA men were satisfied with their catch, the net was sunk and the base lifted out to allow the remaining thousands to swim free, the job done with such care, that there were no visible casualties. Before Christmas, I had found the River Blackwater flooded and coloured, requiring a switch to a still water close to home, but with no rain for over a week, I drove to the river before noon, finding it running fast, but clear. This was to be only my third visit to this Surrey stretch and followed the river downstream looking for a swim with clearance overhead for my 14 foot Browning float rod. On the inside of a bend, I set my tackle box down on a sand bank, where the flow ran down the far side, before sweeping across to the middle for the next bend, an ideal stick float swim. Plumbing the depth, there was three feet of water close to the far bank and I set up a heavy 6 No 4 ali stemmed stick float to cope with the rapid pace of the river. Preparing to fish the bread punch, I had no idea what fish to expect in this swim, it looked chubby, but I expected roach to be the main contenders for my bait. I fed a couple of firm balls of liquidised bread upstream of my swim, watching them swirl in the current, sinking with a tail of fine particles, as they sped downstream. The temperature was not far off zero and I started with 5 mm bread pellet on a size 18 hook, fishing for bites, just to see what turned up. Without a bite on the first few trots, I put in another ball, following it down with the float. A lightning quick dip of the float and the absence of bait on the hook was encouraging and I followed another ball down to more unstrikeable dips. I put another No 4 shot under the float and raised it three inches, slowing the float, easing the line over my finger. The float tip was now just above the surface and held down for half a second. I struck to firm resistance, seeing a bar of silver arc across the stream, as a very good dace broke surface. The net came out, as I slowly led the fish upstream to it. A hard fighting kipper dace, was followed by another next cast, each time the float was checked, it dipped and sank from view. Several smaller roach now intercepted the bait further up the swim and I stopped my regular pigeon sized balls, these fish keen to hang on the the bait, rarely sinking the float, but most strikes resulting in a roach on. 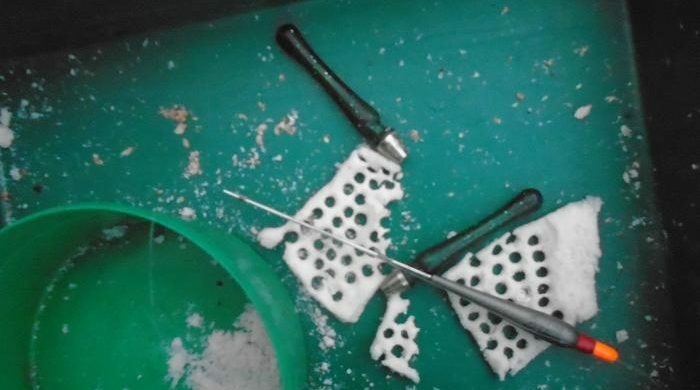 I tried a 6 mm punch to get through to better fish, but this meant more bumped, or missed bites. Going back to the 5 mm pellet brought a firm bite and a good dace tumbling back to the net. The bites were now coming 15 yards down the trot, and I let the float run at half speed, then held back hard, the float submerging on cue, as a nice sized roach dived off downstream, the initial fight more like a chub in this speedy little river. The roach had moved onto the feed, out numbering the dace two to one, when I netted this clonker. “That’s a nice one” I turned round to see another angler standing behind me. “What bait are you using?” I held up a square of punched bread. “Bread punch.” He stood and watched as I netted another roach, then a good dace in quick succession. He had only had a couple of small roach and a perch all morning, the fish only tipping the ends of his maggots. Not concentrating, I began missing bites, so rested my rod and poured myself a cup of tea, while we talked, dipping into the bag of sandwiches prepared by my wife that morning. Ooooh, turkey and honey glazed ham, spread with cranberry sauce, just what the doctor ordered! These conversations with locals can be useful, this guy telling me of free fishing on the river Wey in the heart of Farnham, including all the best parking spots. Another new water to add to my list. As the angler continued back to his car, I dropped another couple of balls of bread feed along the far bank, following down with the float, which sank deep out of sight immediately, the rod bending over, following the unseen fish, as it dashed off downstream, while I backwound the reel to avoid a break. The fish stayed deep, slowly shaking its head, as I regained line. It felt like a small pike that had grabbed a roach, but a green flank with black bars indicated a chunky perch. The perch rolled as it neared the landing net, but the hook held its grip on the edge of the big white extended mouth, long enough to be lifted to safety. I have caught perch on the punch before, but this is one of the biggest, the carnivore mistaking the bread for something living, when it dropped from the surface. The dace fest continued, the fish having dropped further down the swim, the current taking the float beyond an overhanging branch, where stopping the float at the end of the trot and pulling upstream brought savage takes. My last fish of the afternoon was a roach taken at the bottom of the trot, that fought all the way back, being convinced that I would lose it, even at the net. My next trot had reached the overhanging branch, when the float pulled under, bending the rod round and setting the hook as the fish rushed off downstream, while I gave line over my controlling finger. 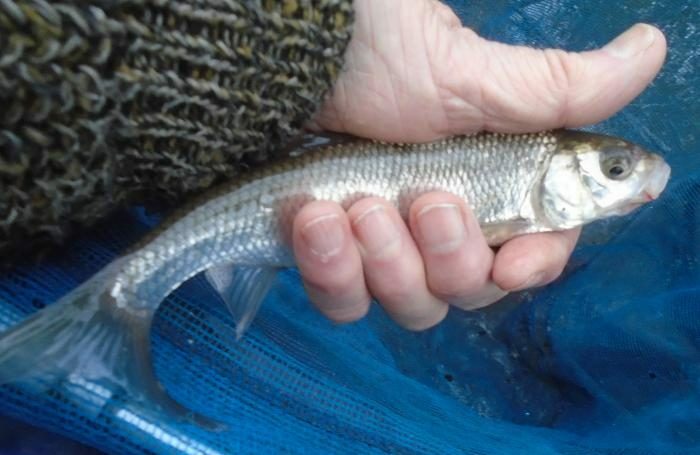 Raising the rod, the tip bent and bucked with a very good fish, closing the bail arm to reel, what I could see to be a chub of about 2 lb, its white mouth clear of the water. I decided to close the gap by tucking the landing net under my arm and reeling the line back to the chub. Big mistake. 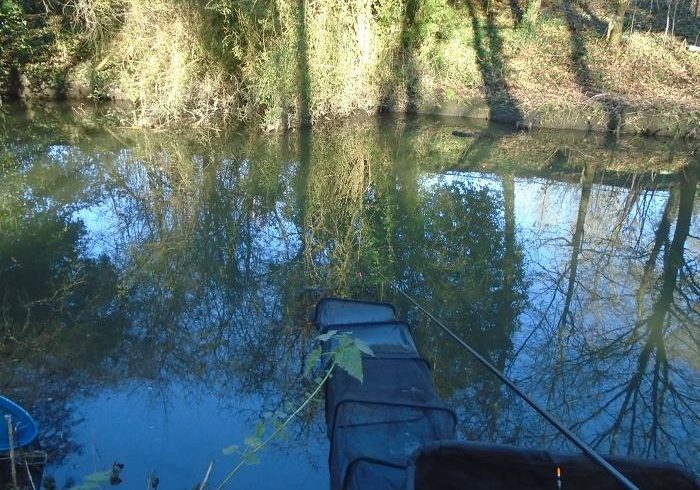 Looking down at the chub, I had not taken account of a tree overhanging the bank, managing to walk the rod into the tangle of branches overhead, leaving the chub stranded in the shallows, flapping about until the hook came free. This was the end of my session. I retrieved the precious float rig, cutting the line to pull back through the branches and returned to my box. Where I was standing had been alongside the overhanging branch, the bottom clearly visible and only two feet deep at this point. Although there was still at least another half hour’s good light left of the afternoon, it would have taken that long to bring the fish back. A pleasing sight on a near freezing afternoon at the very start of the year. I will be back to explore further.